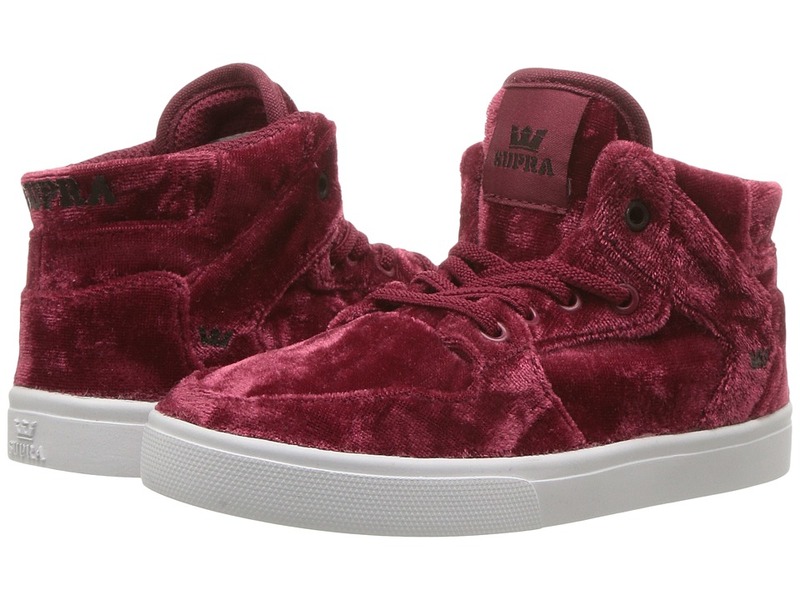 The traditional high top Vaider by Supra is a go-to when you~re wanting that authentic look for the kid! Hi-top silhouette offers added ankle support. Durable canvas and leather upper. 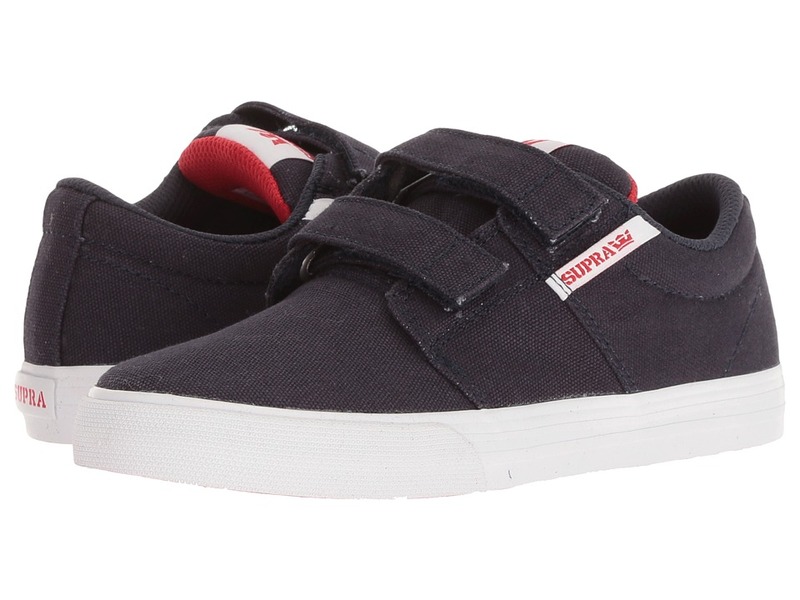 Padded tongue and collar for supreme comfort. Breathable textile-fabric lining Extra heel protection molded into the comfortable, high memory, polyurethane insole. Ultralightweight and breathable SupraFoam midsole provides the entire foot with impact resistance and optimal shoe flex. Durable rubber outsole. Imported. Measurements: Weight: 9 oz Shaft: 3 in Product measurements were taken using size 2 Little Kid, width M. Please note that measurements may vary by size. Weight of footwear is based on a single item, not a pair. 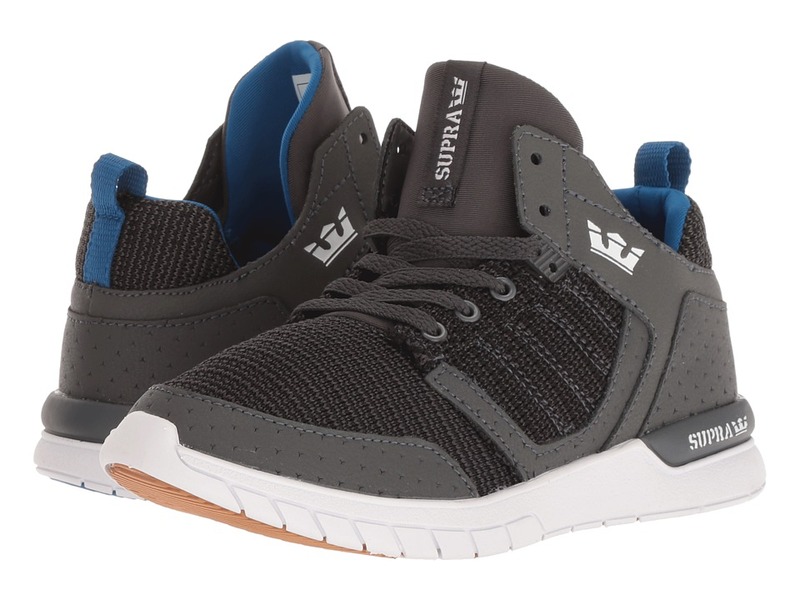 Keep it on fleek in the Vaider mid-tops from Supra Kids! Durable canvas upper. Mid-top silhouette with an extra-long tongue. Lace-up closure for easy on and off. Comfortable mesh lining. Supra logo details on tongue, heel, and lateral side. Durable rubber outsole for traction. Imported. Measurements: Weight: 3 oz Product measurements were taken using size 8 Toddler, width M. Please note that measurements may vary by size. Weight of footwear is based on a single item, not a pair. 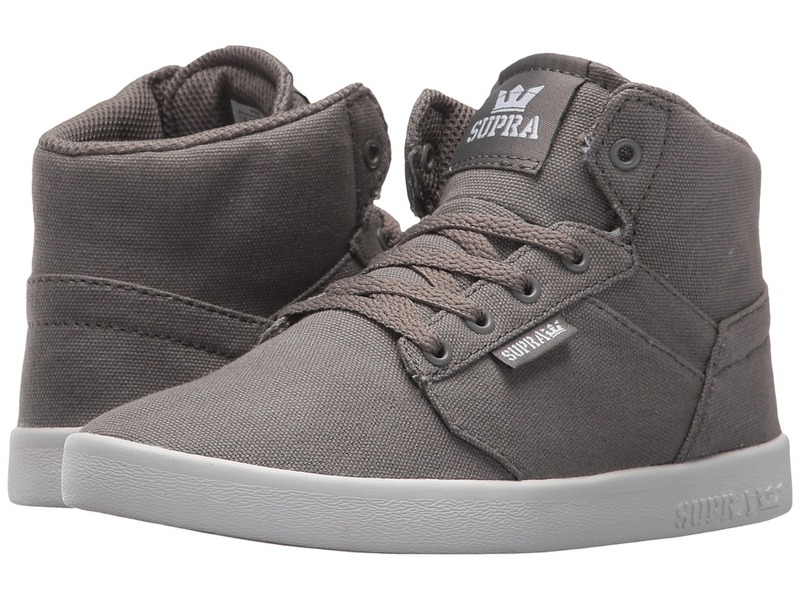 You~ll be skate-ready with the Supra Stacks Vulc II shoe! Uppers of durable suede and canvas. A slim, low-top skate silhouette. Lace-up closure with metal eyelets. Padded mesh lining. 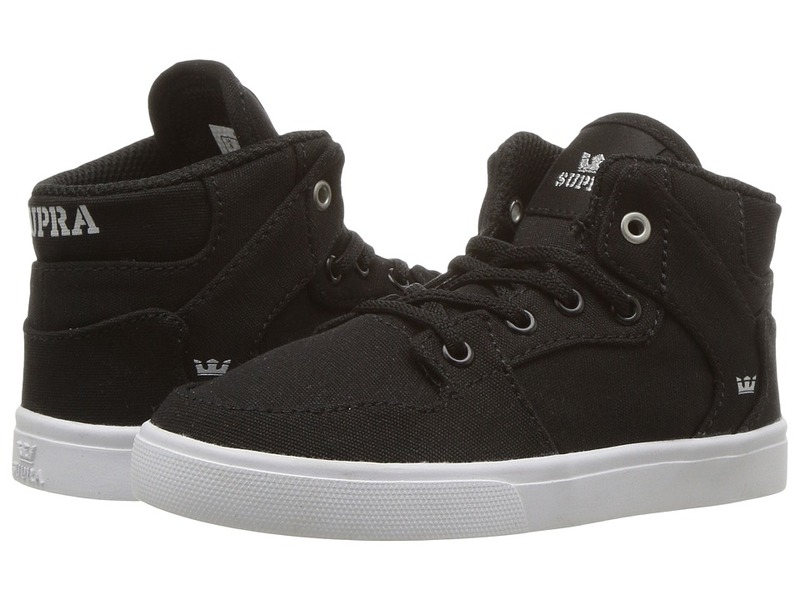 SupraFoam midsole provides the entire foot with superior impact resistance. Classic vulcanized construction for increased traction and enhanced board feel. Imported. Measurements: Weight: 10 oz Product measurements were taken using size 2 Little Kid, width M. Please note that measurements may vary by size. Weight of footwear is based on a single item, not a pair. 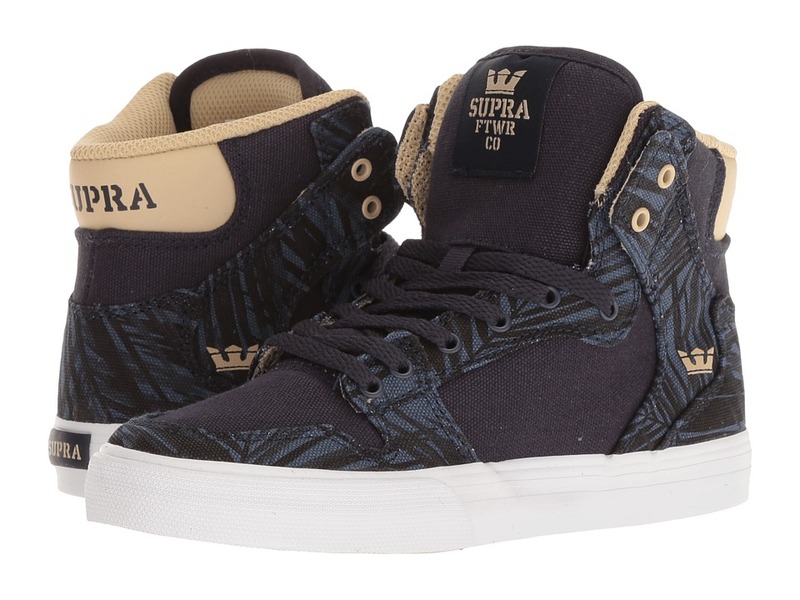 Clean lines deliver cleans cuts out on the street and skatepark with the Supra Yorek Hi! Durable canvas upper. Hi-top silhouette. Lace-up closure for a snug wear. Mesh lining for a breathable wear in shoe. Angular panels of unadorned materials for a stylish design. Cradled on a lightweight cupsole for durable wear. Synthetic outsole. Imported. Measurements: Weight: 6.5 oz Product measurements were taken using size 1 Little Kid, width M. Please note that measurements may vary by size. Weight of footwear is based on a single item, not a pair. 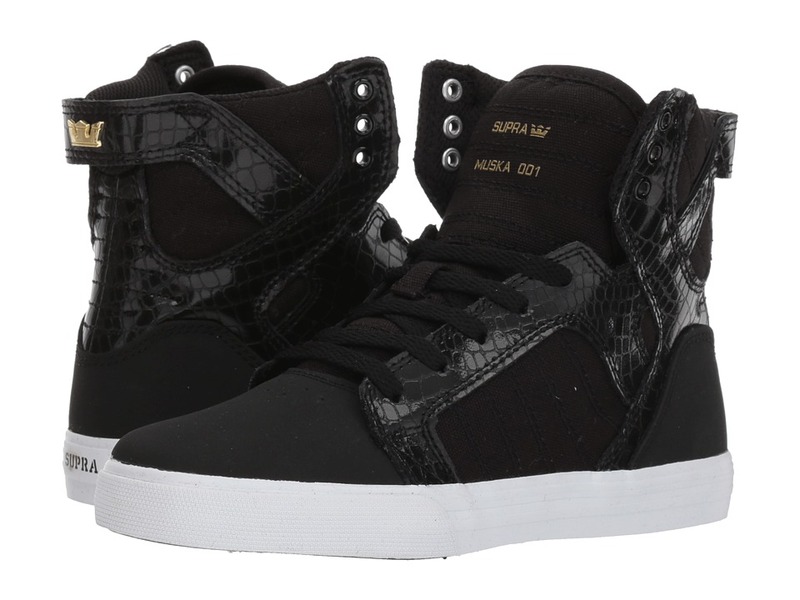 Come equipped with the modern stylings and innovative comfort of the fresh Supra Method shoe! Athletic mid-top silhouette in a versatile design. Uppers of durable leather and mesh materials. Layered exterior paneling harkens to the recognizable lines of the Vaider and Skytop. EVA cushioned midsole for all-day comfort. Asymmetric toecap provides additional containment to the internal neoprene bootie system. Rubber landing pads for flexible grip. Imported. Measurements: Weight: 6 oz Product measurements were taken using size 2 Little Kid, width M. Please note that measurements may vary by size. Weight of footwear is based on a single item, not a pair. 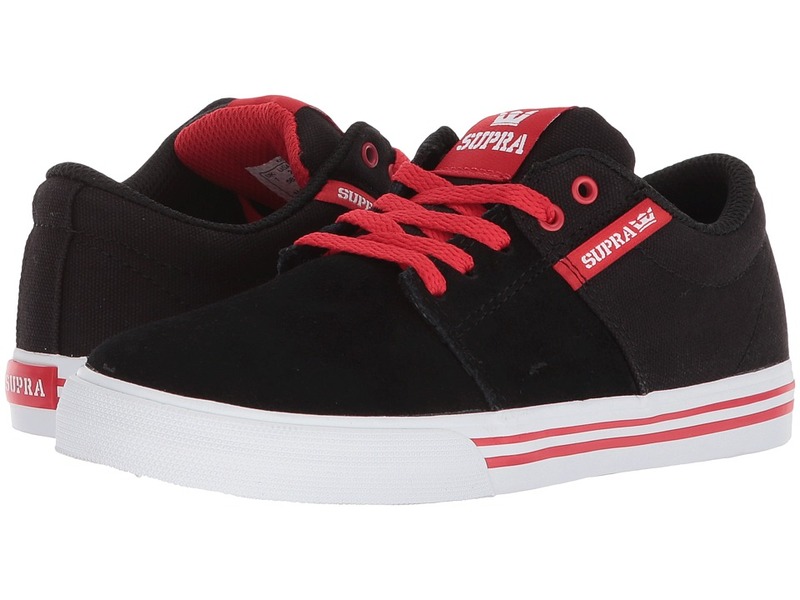 You~ll be skate-ready with the Supra Stacks Vulc II hook-and-loop shoe! Uppers of durable suede and canvas. A slim, low-top skate silhouette. Hook-and-loop closure. Padded mesh lining. SupraFoam midsole provides the entire foot with superior impact resistance. Classic vulcanized construction for increased traction and enhanced board feel. Imported. Measurements: Weight: 8 oz Product measurements were taken using size 2 Little Kid, width M. Please note that measurements may vary by size. Weight of footwear is based on a single item, not a pair.